Note: This profile was originally posted September 1, 2013. Scroll down to the update posted October 1, 2013. I started collecting bottles around the age of 13. A couple of friends and I were very interested in treasure hunting in general and we found that bottles were something we could hunt for where we lived, in small town Iowa. In high school, I lived on a small farm near Denver, Iowa. The house we lived in was less than ten years old and had been built in place of the old farm house. In the back yard, in a pile of rubble, I found Hutchinson sodas (my first two) from Waterloo, Iowa and Albert Lea, Minnesota. and a quart blob soda from Waverly, Iowa. I later learned there had been a big dump in the back yard that was hauled away when the new house was built. It still makes me sad to think about it! 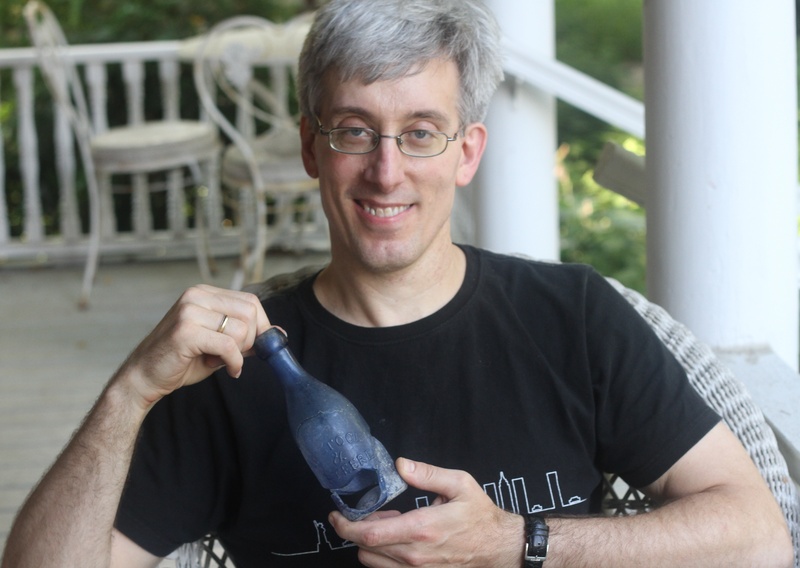 Joe Hagedorn is holding a glued together, cobalt blue, pontiled, COMSTOCK / & / STEERE / ST PAUL, MIN pony soda bottle dug in Minneapolis (bottle #BM-0615A at www.SodasAndBeers.com). WERE YOU A COLLECTOR AS A CHILD? WHAT DID YOU COLLECT? HOW EARLY DID YOU START COLLECTING? Before bottles, I collected coins and stamps, starting around age 8 or 9. WHAT IS YOUR CURRENT BOTTLE COLLECTING SPECIALTY? WHY? DO YOU COLLECT BOTTLES OTHER THAN SODAS? I really only collect Hutchinson sodas. I have sought Hutchinsons from all of the United States. However, I do enjoy digging all kinds of bottles and sometimes keep my favorites from other bottle categories. HAS YOUR BOTTLE COLLECTING SPECIALTY AREA OF INTEREST CHANGED OVER THE YEARS? HOW? Several years ago, I realized that I needed to put some kind of limitations on my Hutchinson collecting because of the huge number of different bottles that exist. So, I came up with a plan to aim for acquiring a certain number of Hutchinsons from each state before I reached the age at which I should think about selling them. I am getting close to that age now, but probably will not reach all of my targets, especially for some of the tougher states like Montana and the Dakotas. However, it has been a fun way to keep my collecting organized. My favorite Hutchinsons are those with funny or unusual names such as "Harry Slutz," "Frank Malarkey," the "Fire Extinguisher" from Louisville, quart Hutchinsons of which there are many from Minnesota, and colored Hutchinsons. HOW DO YOU ACQUIRE BOTTLES FOR YOUR COLLECTION? ARE YOU A DIGGER? DO YOU HAVE A FAVORITE DIGGING STORY? My favorite dig of all times was a large construction site in downtown Minneapolis about 15 years ago. The workers made the site available to us after hours and a number of diggers had worked at the site for a few days with only a handful of good finds. On the day I was finally able to join in, late in the afternoon, we found a pit measuring about twelve feet square and about six feet deep. There was nothing in the pit except for sodas and beers from 1880-1890 and six or seven of us divided up over a hundred choice pieces. We didn't leave the site until around 11:00 p.m.
WHAT IS/ARE THE BEST HUTCHINSON BOTTLES YOU HAVE FOUND? My two favorite colored Hutchinsons are a pair from the Spa Bottling Company that I dug with friends in St. Paul, Minnesota. Some of Joe Hagedorn's favorite Hutchinsons. Left to right: MI0166, MN0090, MN0417, and PA2083. Many are in boxes, but I keep most of my local Hutchinsons on shelves in my study. I haven't looked very hard for those kinds of sites. DO YOU COLLECT SOMETHING OTHER THAN BOTTLES? My EMail address is: hagedorn@visi.com. Joe, I would like to become a project member. I was beginning to wonder if anyone had realized the need of such a book as you are writing. I have been collecting bottles for about a year now and just recently decided to collect only Hutchinson bottles. I saw your sample page in Old Bottle Magazine, so I included everything about my bottles that you had decided to put in the book except for rarity. I tried to make the rubbings as clear as I could and I hope you can use them, but I really can't help you with with the rarity of them, since I haven't seen enough bottles to really know just what is hard to find and what isn't. You mentioned in the bottle magazine that you were interested in histories. I live close to Waverly, Iowa, and, therefore have found out quite a bit about its Hutchinson history. I heard of the Waverly Hutchinson from a bottle store owner not far from me. He told me of a place where people were finding them. Well, I've been searching for at least three months now and haven't found a trace of one. So, I decided to do some research. I finally found a fine example of one in the Bremer County Historical Society. Then I went to the library in Waverly and found a history of the Waverly Bottling Co. 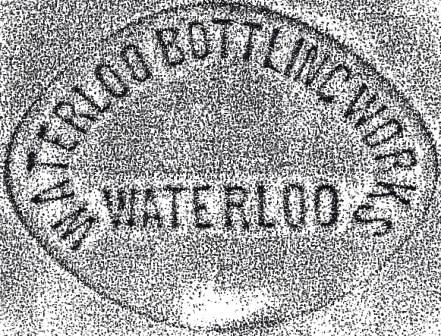 It said that the company wasn't started until 1908 which should explain the scarceness of the bottles...The company must not have been in business long because the crown top Waverly bottles are about just as scarce. You may already have a rubbing of a Waverly Hutch but just in case you don't I'll try to get one to you. I have a friend who has one. Most of the Waverly's are aqua, however, the bottle store owner told me that cobalt blue Hutchinsons from Waverly have been found. I'm not swearing that is true but I do know that if you get any reports of one, that it must be a very rare bottle. My name is Joe Hagedorn. I live in Denver, Iowa just north of Waterloo. I am seventeen years old and my interests include music, art, sports, antiques, and, of course, bottles. I'm glad you're making this book...from now until you finish this book, I will try to get some more rubbings to you whenever I see a different bottle than mine. IA0312 rubbing by Joe Hagedorn noted "The first Hutch I ever found - lying on the ground in my backyard!" We recently returned the original letter to Joe and he graciously allowed us to publish it. Check the date of the letter again and realize how fortunate it is he followed thru on his promise to submit Hutchinson data for the Hutchinson Bottle Directory initiative. During the past thirty-three years, Joe has submitted rubbings and data for hundreds of Hutchinsons. Joe is second only to Tod von Mechow for the quantity and quality of data submitted (early on Tod contributed all of the Hutchinson data from what has since become the www.SodasAndBeers.com database and, like Joe, he continues to regularly submit data). Joe's significant contributions to our hobby clearly illustrate the importance of continuing to attract and actively support our hobby's younger/new collectors.